'I'm a legal engineer,' says Alnajafi I navigate legal issues and solutions that help build the ultimate consumer product. 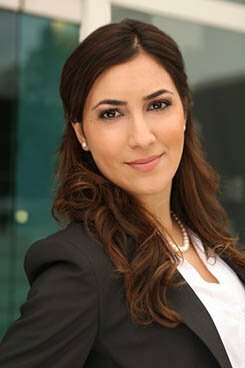 In order to meet the start-up electric car company’s aggressive go-to-market timeline for its first production vehicle, Senior Corporate Counsel Nada Alnajafi led Faraday Future’s initiative to optimize the company-wide contracts management process by moving to a highly automated, smart technology solution. While attorneys usually have mentors who are also attorneys, my most important mentor has been a one-of-a-kind businesswoman named Paula Simaan, National Manager of Lexus, who taught me how to be more than an attorney but also a businesswoman. During my time as Lexus’s first dedicated in-house counsel, I partnered closely with Paula to understand the company, its people, and its processes. Together, we built a brand new role with brand new processes. Paula taught me how to operate within the corporate environment both effectively and efficiently. She taught me about corporate communications, change management, and strategic decision-making. As a leader, she was always thoughtful, humble, and hard working. Through her example, I learned many valuable business lessons and skills that make me a well-rounded corporate attorney today. One of the biggest challenges of working in the tech sector is understanding the tech products and services being offered by my client(s). All products are built by engineers of all different backgrounds and expertise; software engineers, battery engineers, electrical engineers. I’m a legal engineer, and I navigate legal issues and solutions that help build the ultimate consumer product. What’s one-way technology has made your life easier? It has given me the gift of time by enabling me to do things more efficiently in both my professional and personal life. I don’t think its made my life more difficult, but it has certainly presented new challenges that I enjoy navigating. During my career, I’ve had several opportunities to take the easy way out and work for a company or firm that didn’t match my aspirations. I never settled for any of those opportunities and instead worked even harder to pave the way towards the career I have always wanted. I’ve been interested in technology from the start of my legal career because it provides an opportunity to practice IP law, corporate law, and areas of the law that are not yet invented. While I have had amazing mentors in my life, the best leadership advice I ever received was from a leadership book called ‘Power: Why Some People Have It and Others Don’t’ by Jeffrey Pfeffer. The advice was: “Don’t be afraid to stand out and break the rules” to differentiate yourself from the competition. As most of us attorneys already know, rules tend to favor rule makers, and rule makers tend to be those who are already in power. But if you are someone who’s still acquiring power, i.e. a young corporate attorney, then the standard rules aren’t necessarily going to benefit you, so why follow them? I tested out this theory during an interview for a director-level position with a Fortune 500 tech company. “Just practice,” I told myself. “There’s no way I’ll ever get the offer, I’m not experienced enough for this.” I approached the interview as an experiment that I was willing (and expecting) to fail and therefore, had nothing to lose. One part of the 8-hour interview was to present on a topic of my choosing for 30 minutes. After going back and forth about the topic for days, I decided hours before to present a training I developed called IP & IPAs which provides an overview of relevant IP laws to engineers using IPAs (yes, beer) as both a hypothetical and literal example. Not surprisingly, engineers love it! And it quickly became a popular training that they not only enjoyed but also learned from. On the Uber ride over to the interview, I stopped at a liquor store and bought a six-pack of IPAs, the whole time thinking nervously to myself, “Oh My God, am I really about to do this?” When the time came to begin my presentation, I nervously stood up, pulled the beer out of my purse, set it down on the table, and offered the panel a beer. I knew from the looks on their faces that I had their undivided attention. My presentation did not abide by conventional rules by any means. But I was offered the job shortly after. I think the best way to impact tech’s gender gap is to hire more women, whenever given the opportunity. Today’s in-house lawyers should be leveraging current artificial intelligence (AI) tools that optimize efficiencies in the contracts management process. Because I am always in motion, I am most excited about the technologies impacting the way we transport people and things to different places, such as ridesharing, electric scooters, and hyperloop trains.